LONDON: 11 MARCH 2016 - The directors of ECR Minerals plc (the “Directors”) are pleased to announce the following with reference to the convertible loan facility (the “Facility”) in place with YA Global Master SPV Ltd (the “Investor”), an investment fund managed by Yorkville Advisors Global, LP (as previously announced on 3 September 2014). The Company and the Investor have agreed to the drawdown by ECR of four further loan tranches (each a “Tranche”) under the Facility, for a total principal amount of US$600,000. The aggregate net proceeds of the Tranches are expected to be US$555,000. The first of the Tranches (the “First Tranche”), in the amount of US$250,000, has been drawn down. The second Tranche, in the amount of US$150,000, will be drawn down on or about 1 April 2016; the third Tranche, in the amount of US$100,000, will be drawn down on or about 2 May 2016; and the fourth Tranche, in the amount of US$100,000, will be drawn down on or about 1 June 2016. The principal terms of the Facility, which are applicable to the Tranches, are described below. 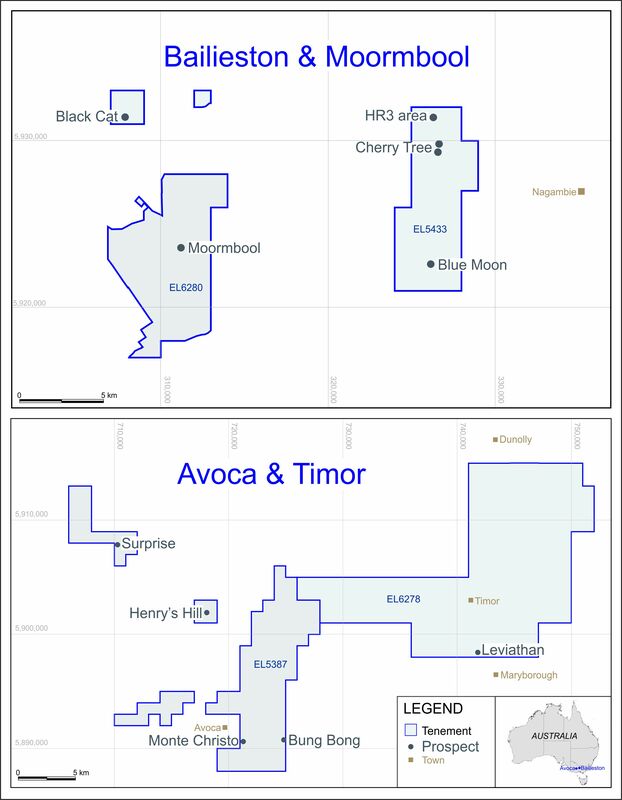 ECR intends to deploy the net proceeds of the Tranches primarily in connection with the Avoca and Bailieston gold projects in Victoria, Australia, of which the Company’s wholly owned Australian subsidiary Mercator Gold Australia Pty Ltd (“MGA”) has recently agreed to acquire 100% ownership (see the Company’s announcement dated 3 March 2016), and for general working capital purposes. A JORC Code-compliant technical report in relation to the Avoca and Bailieston gold projects is being prepared by Snowden Mining Industry Consultants, and is expected to be published by ECR during March 2016. The acquisition remains conditional on the necessary Victorian government authorisations and registration of the transfer of the Projects to MGA. The outstanding principal amount of a loan tranche (a “Loan”) drawn down by ECR under the Facility is convertible at the Investor’s option into ordinary shares of the Company of 0.001 pence (“Ordinary Shares”) on the following terms: either (a) at 92.5% of the average daily volume weighted average price (VWAP) of the Ordinary Shares during the 10 trading days preceding the conversion date, conversion on this basis being restricted (unless the Company consents otherwise) to a maximum amount of US$250,000 per calendar month (a limit which applies to all Loans outstanding under the Facility collectively); or (b) at 0.0363 pence in the case of the First Tranche or, in relation to any subsequent Tranche or any other subsequent Loan under the Facility, 150% of the average daily VWAP of the Ordinary Shares during the five trading days preceding drawdown of the relevant Loan, conversion on this basis being subject to no maximum amount. Prior to maturity of a Loan, the Investor may choose between conversion options (a) or (b) as described above. On maturity of a Loan, which shall be two years from the date of drawdown (extendable by up to one year at the option of the Investor) any outstanding principal amount will be mandatorily converted to Ordinary Shares at the closing price of the Ordinary Shares on or immediately prior to the maturity date. Interest on the outstanding principal amount of a Loan will accrue at 10% per annum, payable in Ordinary Shares at 92.5% of the average daily VWAP of the Ordinary Shares during the 10 trading days prior to the interest payment date. An implementation fee of 7.5% of the principal amount of each Loan is payable to the Investor upon drawdown of the relevant Loan. The Company is entitled to prepay a Loan in cash, in whole or in part, by making a payment to the Investor equal to the principal amount to be prepaid plus any interest due and an additional amount of 10% of the principal amount to be prepaid. The Facility provides for customary events of default, and following an event of default the outstanding principal amount of a Loan plus interest may in certain circumstances become immediately due and payable in cash. If an event of default has been continuing for at least 30 calendar days, the outstanding principal amount of a Loan may at the Investor’s option be converted in whole or in part to Ordinary Shares at 80% of the VWAP of the Ordinary Shares for the five trading days preceding the date of such a conversion. The drawdown by the Company of the three further Tranches besides the First Tranche is conditional, inter alia, on there being at the relevant time no event of default which is continuing and on certain warranties given by the Company to the Investor being true and accurate by reference to the facts and circumstances then existing. In the event that the 30 day moving average closing price of the Ordinary Shares falls below the nominal value of an Ordinary Share for a period of five consecutive trading days, the outstanding principal amount of a Loan shall become repayable in cash on a monthly basis over the remaining term of the Loan, with interest also payable in cash. If the closing price of the Ordinary Shares were to subsequently cease to be less than the nominal value of an Ordinary Share for a period of 10 consecutive trading days, the monthly cash repayments would no longer be required and the Loan would revert to being convertible into Ordinary Shares on the prior terms. With respect to the First Tranche, the Investor has received 171,755,725 warrants, each exercisable to acquire one Ordinary Share for a price of 0.0328 pence and valid for three years. In connection with the three further Tranches and with any other subsequent Loan, the Investor will receive a quantity of warrants equal to 25% of the principal amount of such Loan (converted to £) divided by the closing price of the Ordinary Shares on the trading day prior to the date of drawdown, each warrant to be valid for three years and exercisable to acquire one Ordinary Share for a price equal to 125% of the closing price of the Ordinary Shares on the trading day prior to the date of drawdown, as reported by Bloomberg. The Investor and its affiliates, associates, partners and insiders are prohibited under the terms of the Facility from holding a net short position in respect of Ordinary Shares at any time, and from assisting or enabling any other person to do so (including by lending Ordinary Shares). The Facility is available to the Company for three years from 2 September 2014 and provides a framework for the drawdown by ECR of Loans up to US$10 million in aggregate principal amount. ECR received a Loan under the Facility of US$1.5 million in principal amount in September 2014, and further Loans totalling US$750,000 during calendar year 2015. The drawdown of any further Loans besides the Tranches which are the subject of this announcement is by agreement between the Company and the Investor. Neither party is under any obligation to agree to any further Loan. In recognition of YA Global’s continued financial support for ECR, the Company has agreed to amend the exercise prices of all warrants previously issued by ECR to YA Global in accordance with the table below. The two amended exercise prices, 0.0328 and 0.0393 pence, are equal, respectively, to 125% and 150% of the closing price of Ordinary Shares, as reported by Bloomberg, on 8 March 2016 (being the date immediately prior to the date of the agreement between the Company and YA Global in respect of the Tranches). All the warrants which have been issued to YA Global are valid for three years from their date of issue. * Excludes warrants which will be issued to YA Global on draw down of the second, third and fourth Tranches referred to by this announcement.